Having a vast experience in various major governmental organizations including Saudi Arabian National Guard (1984-90) and Saudi TV channel 2, Yousef joined CPG in 2017, working as CPG Communication Administrator. 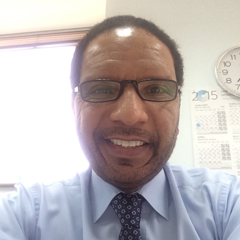 Prior to joining CPG, he was working as PR Specialist & Government Affairs Staff Advisor at Saudi Aramco from 1991 and retired in 2016 as Career Counselor. B.A, Double Major in English Inter-Personal Communication & French Linguistics, Sonoma State University, 1983, California, USA. French Language Training (summer classes) 1980-1982, University of Nice, France. Human Resources Development Program September 16-18, 1987, American Management Association, New York.